Try our Natural Emerald Crystal Specimens Satisfaction Guarantee - compare our prices and our superior quality. Click on any natural emerald mineral specimen image below to enlarge it. Emerald in Matrix Dimensions: 2.9" x 1.8" x 1.7"
This natural emerald in matrix specimen has a 3/4 inch long emerald crystal perched up on top. The matrix is quartz with some black biotite. Emerald in Matrix Dimensions: 3.2" x 2.2" x 1.6"
This natural emerald in matrix specimen has a 3/4 inch long emerald crystal in quartz matrix with some black biotite. Emerald in Matrix Dimensions: 2.6" x 2.2" x 1.5"
This natural emerald in matrix specimen has a 3/4 inch long emerald crystal in quartz matrix. There are two more emerald crystals exposed on the opposite side. Emerald in Matrix Dimensions: 2.9" x 2.4" x 1.4"
This natural emerald in matrix specimen has a several emerald crystals in a gray crystalline limestone matrix. Emerald in Matrix Dimensions: 3.1" x 2.6" x 1.3"
This natural emerald with matrix specimen has many intergrown emerald crystals with some gray limestone and black biotite. Emerald in Matrix Dimensions: 3.3" x 2.4" x 1.5"
This natural emerald in matrix specimen has a 0.9 inch long emerald crystal in a gray crystalline limestone matrix with some graphite. Emerald in matrix dimensions: 4.5" x 2.7" x 2.5"
This natural emerald in matrix specimen has a 1.3 inch long partially terminated emerald crystal in a matrix of translucent gray-green crystalline limestone. Emerald in matrix dimensions: 4" x 2.1" x 1.7"
This natural emerald in matrix specimen has a 1.5 inch long partially terminated emerald crystal in a matrix of translucent gray crystalline limestone with biotite mica and a small amount of graphite. Emerald in matrix dimensions: 3.5" x 2.1" x 1.2"
This natural emerald in matrix specimen has a couple of intergrown emerald crystals emerald crystal in a matrix of translucent gray crystalline limestone with biotite mica. Emerald in matrix dimensions: 4" x 3.2" x 2.3"
This natural mineral specimen has a matrix of intergrown emerald crystals that are partially covered by black biotite mica schist. 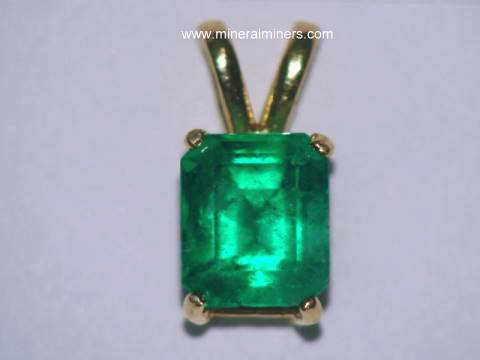 See an opposite side view of this superior collector quality specimen of emeralds in matrix. Emerald in matrix dimensions: 4.1" x 3.3" x 3.3"
This natural mineral specimen has a matrix of dark gray crystalline limestone with several exposed emerald crystals. Emerald in matrix dimensions: 5.9" x 2.9" x 1.6"
This natural mineral specimen has a matrix of intergrown emerald crystals that are partially covered by black biotite mica schist. Emerald in matrix dimensions: 5.7" x 3.5" x 2.5"
This natural mineral specimen has a matrix of gray crystalline limestone on black biotite schist with a cluster of intergrown emerald crystals up on top. Emerald in matrix dimensions: 5.7" x 4.5" x 3.6"
This natural mineral specimen has a matrix of light color crystalline limestone with some black biotite mica schist. There are three large emerald crystals that are partially embedded in one side of this beautiful decorator specimen as shown at left. This specimen also stands up in an upright position. 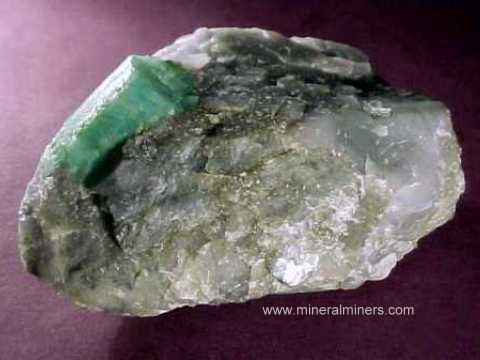 See an upright view of this decorator mineral specimen of large emeralds in matrix. 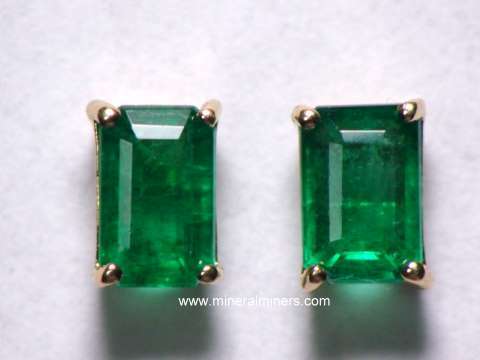 See also a side view of these large emeralds in matrix. Emerald in matrix dimensions: 5.5" x 3.9" x 2.7"
This natural mineral specimen has a matrix of large intergrown emerald crystals that are partially covered by black biotite mica schist. There are several large emerald crystals exposed on the opposite side as well! See an opposite side view of this superior collector quality specimen of large emeralds in matrix. Emerald in matrix dimensions: 7.7" x 5" x 3.7"
This natural mineral specimen has a matrix of gray crystalline limestone with some black biotite schist. 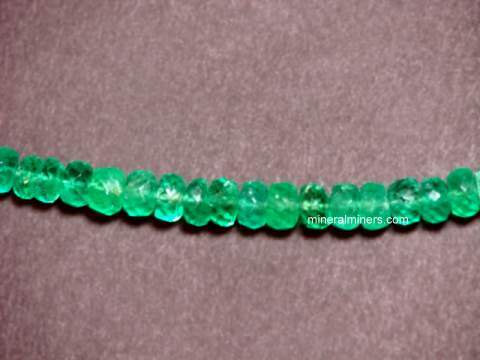 There are dozens of natural emerald crystals including a large "curving" emerald crystal over 4 inches long! There are numeraous emerald crystals exposed on the opposite side as well. See an opposite side view of this rare collector quality emerald in matrix decorator specimen. 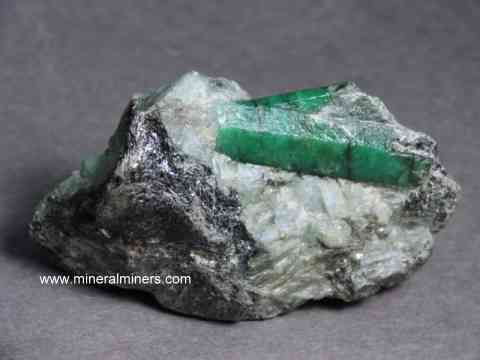 Emerald in Matrix Specimen Dimensions: 8.25" x 5.5" x 3.8"
This natural emerald specimen has a biotite mica schist matrix. The photo at left is a close up photo, see also an additional close-up photo of these natural emerald crystals. This beautiful decorator specimen of natural emerald in matrix has several large emeralds showing fine green color and semi-transparent cabochon grade areas! See a full-view photo of this natural emerald specimen. Each of the above Emerald Crystals and Matrix Mineral Specimens is completely natural - they are unheated & untreated genuine emeralds! 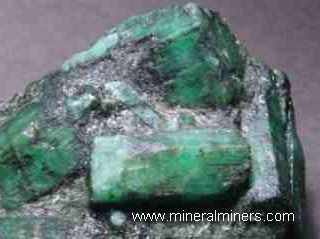 Most of our emerald mineral specimens were mined in Brazil. We have natural emerald crystals in limestone matrix from Bahia, Brazil and from Minas Gerais, Brazil. 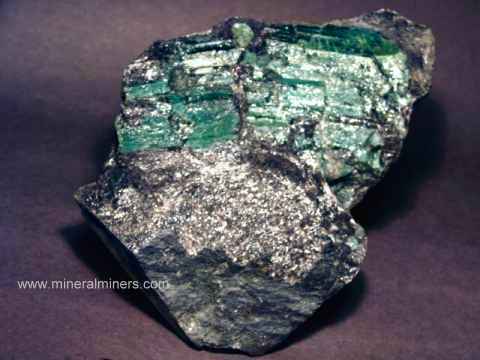 We also have a few emerald in matrix specimens that were mined at Malyshevo, Russia. Our emerald gemstones are from Colombia, Brazil, and Zambia. Here at mineralminers.com, we do not have any lab-created emeralds! 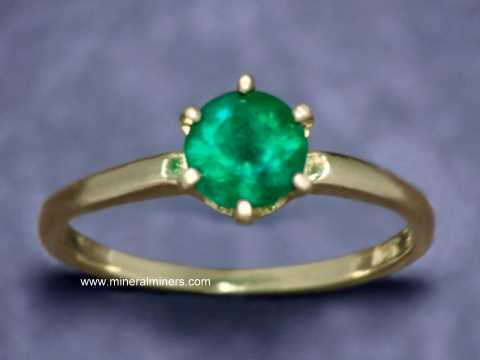 We specialize in genuine natural emeralds. 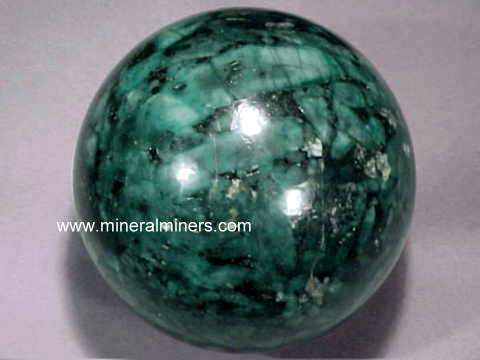 Below you will find more links & information for natural emerald. 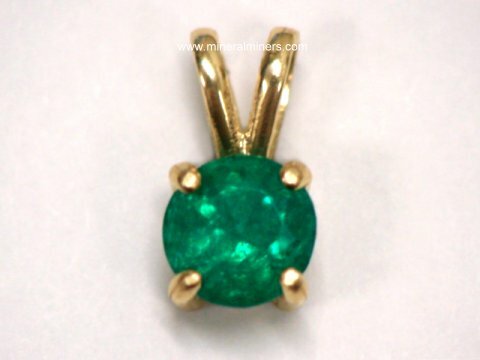 See also our page displaying genuine emerald gemstones. Information about genuine emerald and its history, physical properties, chemistry, occurance, and metaphysical uses is displayed on our emerald information page. To see more emerald photos, just select another linked image displayed below. 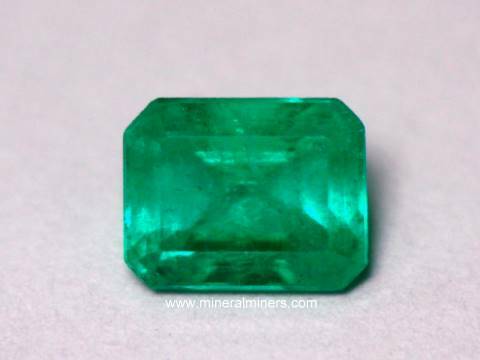 Would you like us to inform you when we add more natural emeralds crystals in matrix on this page? We do have additional inventory of natural emerald crystals and matrix specimens in stock, so be sure to let us know if you have any natural emerald crystal special requests. Please contact our webmaster or our 'site' geologist with any questions or comments. © Copyright 1998, 1999, 2000, 2001, 2002, 2003, 2004, 2005, 2006, 2007, 2008, 2009, 2010, 2011, 2012, 2013, 2014, 2015, 2016, 2017, 2018 Gem & Mineral Miners, Inc.® All Rights Reserved.